Breaking crayons to bits and tearing the paper off is so taboo, a definite no-no from my childhood, and one that has been passed down to Puff. But rule-breaking can be fun, even for inanimate objects! 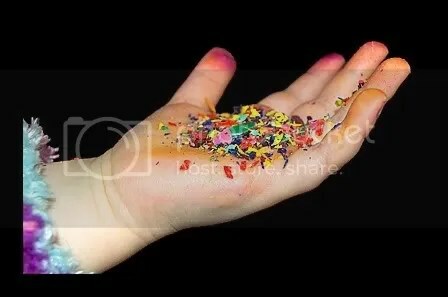 Crayons are a bit tragic, each little bit of happy is so dreadfully confined in it’s little suit and separated – un-mixable with the others who share its box. Me n’ the Puffy Wonder spent an afternoon unleashing a wild and unruly rainbow! We both had a fabulous time flinging colors madly about and being wild children for the hour or so that this project took. The heart-shapes make it Valentine-y, but we can’t wait to try this craft with other shapes, too! 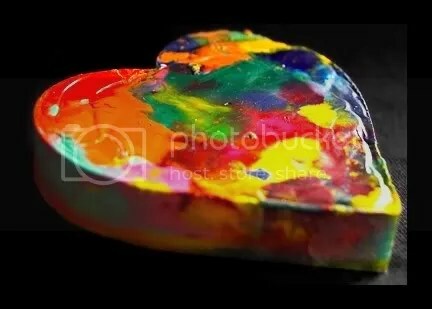 First we gathered all of our broken, worn, and battered crayons from wherever fate had left them. We were lucky enough to have an old hand-me-down box available, and many of the crayons inside were well-loved and battered – in prime recycling condition. Once we had our ‘stash’ together, we peeled the paper off. This is tougher than it looks, and in the end I had to slit the edge of each paper with a knife, while Puffy peeled. Back when she was one, she was SO good at disrobing crayons – I’m not sure if she’s lost her touch, or if we just got a batch of tough crayons. Even I had a tough time with it before we sliced ’em! When the paper was finally off, we broke ’em into smaller bits, and put them into our heart-shaped cookie cutters. 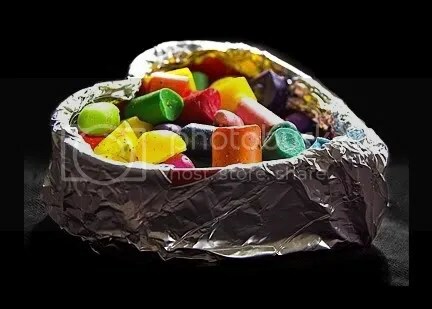 We could have done this more easily with a muffin tin or a metal candy-mold, but we wanted hearts, and I don’t own a tin for heart-shaped muffins OR candy molds. So I lined the outside of each cookie cutter with aluminum foil, pressing it tight to avoid leaking and hooking it over the top slightly. This method worked great! We did have some leakage, but it was a very small bit – I was even surprised at how little mess we made. 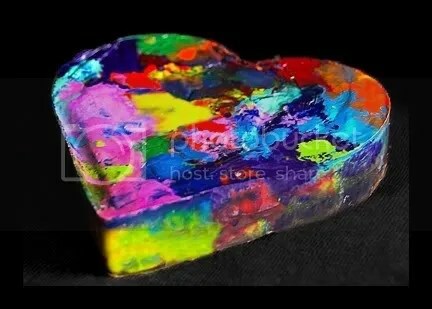 Next we filled our hearts with the crayon bits, put them on a cookie sheet, and popped ’em in the oven. 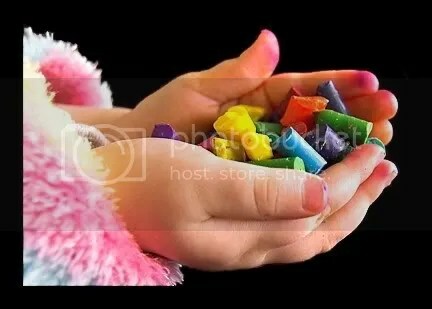 I found about a thousand recipes for ‘cooking’ crayons online, but the lower-heat settings didn’t work for us. 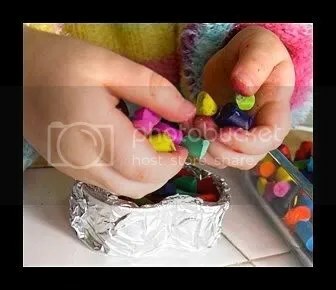 We ended up baking them for 15-20 minutes (until the crayons had juuuuust melted) at 250 degrees. If you do this, be careful. Wax is flammable, so you want to keep a close eye on them, and the kids out of the kitchen! After they were done, we let them cool – obviously. . . it didn’t take too long, though I have to admit that I put them out on the back porch (in freezing weather) because I didn’t want to wait! Puff admires some pretty bits of wax that were too tiny to make it into our new crayons. 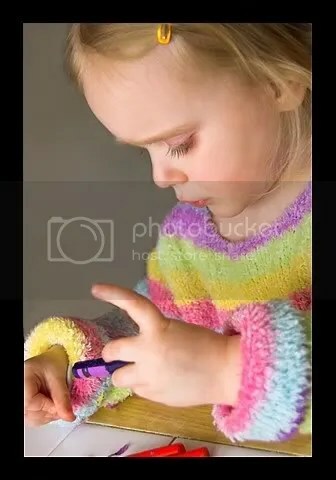 To those of you who might try this, don’t worry, her fingers are dyed from the markers she had played with earlier in the day – not as a result of our crayon destruction! What a great idea. Looks like fun too. I’ll bet something like that would make a good “cheap” birthday present for a little kid. I must say though, I’d be a little nervous about the “flammable” part! I already don’t like cooking with the gas range we currently have (first timer on this one), so I don’t know if I’d brave this project! But, looks like another fun and crafty afternoon at T’s house! It really isn’t THAT scary! I have a gas range too, I think that the chances of it catching fire are pretty slim if you actually pay a little bit of attention to it. . . You should try it, Your little ones would LOVE it, I bet! 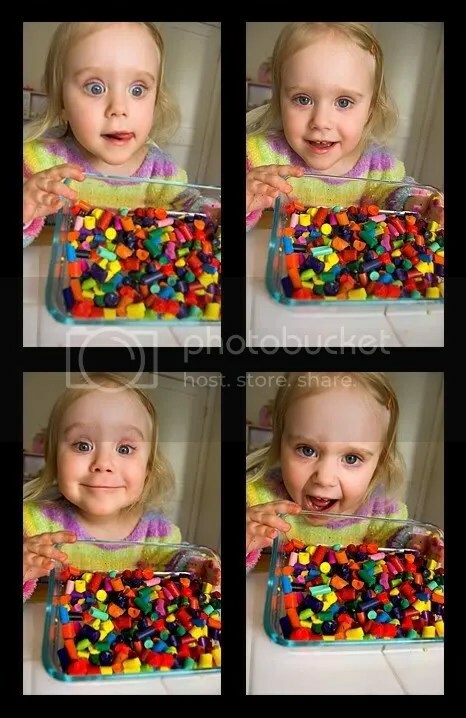 These pictures are amazing!! I love them all, but what I absolutely adore is T’s sweater! WHERE did you get it? I have to know! 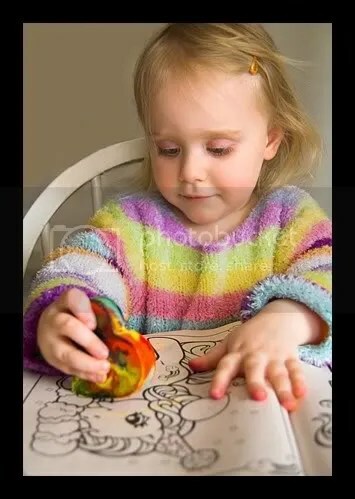 😀 I’m glad that ya’ll had fun…I can’t wait until we have enough crayons to do this with. Thanks, lady – I was THRILLED with how vibrant these images turned out! And the sweater. . . isn’t it a perfect accent for this activity? Totally accidental, I swear! We actually picked it up at a thrift shop for a dollar! Its awesome, Puffy’s dreams come true – raibows, fuzzies, and it even has a bit of sparkle to it! How awesome! 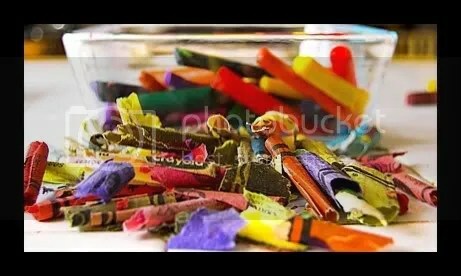 We might be using crayons to do this whether or not they are at a recyling stage or not. Tori’s Valentine’s party is supposed to be Friday (I’m not sure this weather is going to allow it). Anyway, this would make a great little gift for her to give all her little friends at school! I love the pics too. 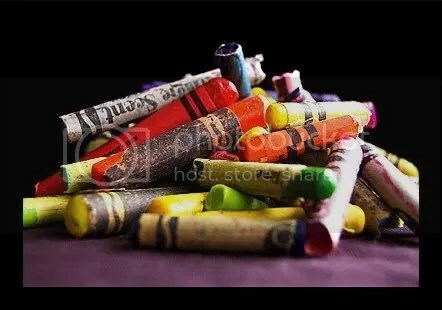 They are always so beautfiul, even for something as simple as crayons. Oooh! That’s a great idea! “Valentine, you color my world!” or something like that. . . But I thought that schools were already closed through Friday? 😦 Will they reschedule? This look like so much fun. 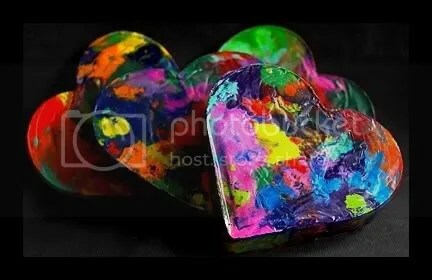 I LOVE the mutlicolor hearts! They’d be pretty hung on the wall. Your pictures of your projects are art. You have an eye for balance and form. I enjoy the viewing as much as the meaning. Hope you and Puff try the birdwatching. Do you have a bird-feeder out? If you put one up now, the birds will have found it by the 13th and Puff will have lots to watch. Thank you so much for your kind words! I’m glad you liked the photos, I was really happy with how these came out. This blog has definitely been good for my photography, though I still have so much to learn! And yeah – we both had fun with this project, we always do! I actually have a post coming up (maybe by next week?) about how T’s been into feeding birds lately. But so far all attempts at bird-feeding has ended with fat squirrels! Of course right now there is about. . .5 feet of snow on the ground, so I don’t know if we can do anything for the poor little guys until after the 13th. Still, I do think that it’d be something we both would enjoy. . . Very good quote and very good pictures. That 4-square of T is DEFINITELY going on my work computer. 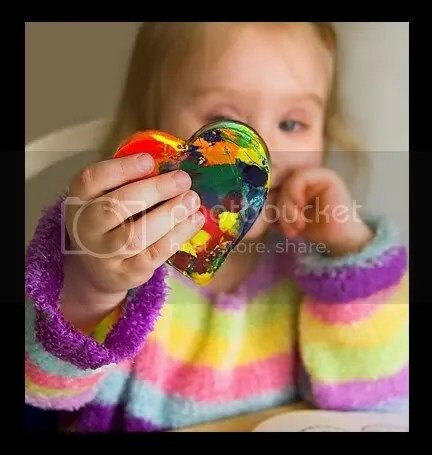 What a great craft those hearts turned out to be. And Puff saying you never know what color they’re going to write. I need to read lots of back posts to get caught up! I love the colour! Perfect for this gray morning. I think I used a muffin tin when I did this , your foil heart shape is a great idea. I’ll try it when my nephew comes in the summer. I know what you mean about the squirrels, they make attracting birds quite a challenge here too.